Kalvin Phillips, who has stepped up in defence in recent weeks for Leeds United. Nine points, three wins and three clean sheets – it has been quite the return to action for Leeds United after the last international break. While the football the team has played in those three matches has not matched some of the high standard from earlier in the season it is a testament to a new found strength in the side that they could pick up maximum points to put them in enough clear water to know that they will still be in second place even if they lose their next game, at home to Queens Park Rangers this Saturday. 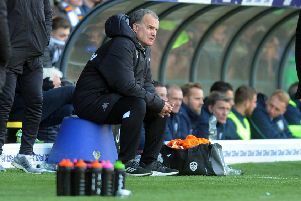 And that those crucial clean sheets have been achieved without key defender Pontus Jansson in the first two instances and then without skipper and equally important central defender Liam Cooper for all bar 20 minutes of last Saturday’s game against fellow promotion contenders Sheffield United adds to the feeling that Marcelo Bielsa’s team really are the real deal. The absence of the senior men at the same time as mainstays Luke Ayling and Gaetano Berardi have been missing through injury as well would have derailed lesser teams. But this Whites team seems to shrug off adversity with Kalvin Phillips rising to the challenge of playing in a centre-half position totally foreign to him four months ago and Aapo Halme belying his lack of senior football experience to do his bit for the team in testing circumstances after making his debut and following up by coming off the bench so early in the huge pressure game at Bramall Lane to take his place in a three-man backline. His performance earned praise from his head coach, Bielsa, and it does not look like being the last time he will be seen in the first team this season. With young goalkeeper Will Huffer getting his first taste of senior football last week against Bristol City and teenagers Jack Clarke and Jamie Shackleton being used as regular substitutes it has been a youthful line-up representing Leeds in these recent games so again it is remarkable that they are so strongly maintaining their challenge near the top of the Sky Bet Championship. Whether the reliance on youth and bad luck with injuries will finally catch up with United time will tell, but they can only go into the QPR game feeling confident now they are finding different ways to win matches – scruffy victories being the trademark of many a title-winning team down the years. They are up against one of the big improvers of the division. Although Rangers were beaten at home by Hull City last weekend they had climbed up into the top 10 before that game, which is no mean feat given their horrendous start to the season, which saw them suffer defeats in their first four league games. They play an attractive brand of football that should make for a good game at Elland Road with some dangerous forwards in their ranks, including emerging talent Eberechi Eze, former Huddersfield Town and Bradford City striker Nahki Wells, Luke Freeman and ex-Leeds target man Matt Smith.